As TellTale Games truly expands their line of excellent produced games in the end of 2011 and beginning in 2012 with magic based on the Jurassic Park movie franchise, and two very popular the Comic books in Image Comics The Walking Dead created by Robert Kirkman and the Vertigo fantasy series FABLES created by Bill Willingham, I thought it best to look at Telltale’s game history as a whole as well as quickly review their three last distributions in Back to The Future-The Game, Puzzle Agent and the second chapters of Hector-Badge of Courage. I’d previously reviewed the first chapter of Hector on PCS, but I’ve yet to throw praise their way for everything else and they’re highly deserving it. So, away we go, with the history of the company as I understand it without all that legal and technical mumbo jumbo and with applauding their efforts and criticizing a bit (because it’s video games and one still must criticize video games) along the way. Telltale was founded by former Lucasarts team members Dan Connors and Kevin Bruner. Both have had an extensive hand both creatively, administrative and technologically in bringing to life some of LucasArts most popular franchises such as Sam & Max and Grim Fandango, along with some Star Wars titles as well. Along the way they’ve been able to bring in some really awesome people to the team including Mike Stemmle, who was co-lead on Sam & Max as well as Escape from Monkey Island, Andy Hartzell, an award winning independent comics cartoonist and most notably Dave Grossman, co-creator of Monkey Island, Pajama Sam, and Moop & Dreadly with Ron “Grumpy Gamer” Gilbert (who now works at the other base of operations for awesome games Doublefine with Tim Schaefer, who worked alongside Stemmle, Connors and Brunner back when) was brought in as head designer. Along with incredible artists, producers and more, this assembled team has allowed Telltale to be one of the only successful adventure game companies in the United States today. Most of the adventure game companies with success are based in England, the Netherlands and Germany. Thankfully though Telltale exists and helps bring franchises you’d think were primed for a game, but also difficult to envision to life. The first series they tackled was Jeff Smith’s BONE. Visually and intellectually, as well as voice acting, this production was awesome, but it definitely suffered serious flaws in their action and mini-games sequences. Despite this, it is a great shame that they only got to do Out From Boneville and The Great Cowrace. I’d love to see them return to the series at some point and maybe try and create a side adventure instead of the adaptations done here. Maybe an untold Grandma Rose story would be best suited. TellTale was given the CSI franchise to develop for publisher Ubisoft, but these games never really seemed to fall into line with where Telltale’s style and bread&butter landed. It wasn’t long into Telltale’s existence as a company though that the opportunity to “come out like gangbusters” presented itself. 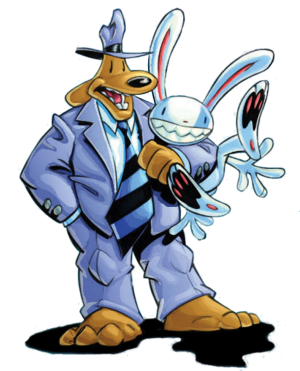 While the exact reasoning behind how Sam & Max ended up at Telltale has many stories suffice it to say they got their hands on the Freelance Police, along with their creator Steve Purcell along for the ride for brand new adventures not tied to the LucasArts design. That gave us “Save The World” which was followed by “Beyond Time & Space” and eventually “The Devil’s Playhouse”. All three games used very interesting and intriguing uses of puzzle design and twists in the adventure gameplay to deliver games that were quite awesome, even if they somehow never have yet to reach the epic-ness that was “On The Road”. This was not for lack of trying. It could be because of the SCUMM system, maybe it’s because of nostalgia on my part. 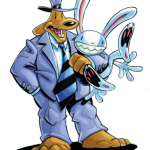 I enjoyed all the Sam & Max games from Telltale but there were decisions made in gameplay style which caused problems. During this time they had also worked with Aardman Animations on their “Wallace & Gromit” franchise. Now I never saw how that could be a video game, but they figured it out. Even more amazingly they found how to turn the Strong Bad flash cartoons in to fascinating and funny games. I was never a fan of Strong Bad and I am still not, but my god, they seriously figured out how to make me in the least like those Strongbad games. It’s a testament to the talent of the Telltale team. In 2010, Telltale became more than just a developer of their own products, but the housing platform for smaller games which would come out on their own, but with Telltale backing them had much more chance at being seen by a public desiring adventure games on all levels. They called it the Pilot program and the first title was Nelson Tethers, Puzzle Agent. Designed by cartoonist Graham Annabelle, who had been working in some capacity at Telltale since 2005 as they published his webcomic DUNK, it was an an example that Telltale didn’t just make good games, but they really could find excellent ones. I actually had problems with Puzzle Agent, both the original and the sequel in the puzzles. Some of them just went beyond my style of thinking. That’s not on me though, the game is called Puzzle Agent and that meant all kinds of puzzles, logic, math, visual, and when it comes to two of those I tend to have some issues, especially super complicated mazes. The game has both super easy and then slider puzzle types and I am not good at slider puzzles. Never hand me a Rubik’s cube, my way of solving it is to crack it open and re-glue it together when solved. Back to the Future: The Game was announced in June of 2010, alongside with the upcoming Jurassic Park, as part of a licensing deal with Universal. Fan interest was high straight from the start and only got higher when the game was announced as “the fourth chapter” in BTTF and that Christopher Lloyd would be voicing Doc Brown. From the first chapter I was immediately sold. While my computer wasn’t completely up to snuff to handle the graphics completely I could tell the writing, acting and gameplay were everything I’d been wanting from Telltale and that the franchise only helped this. I think with this series the company really found their swing. Maybe it was knowing that there would be even more discerning eyes on it to accomplish their goals. Yet, yes, the episodic formula caused this to also suffer from some episodes being weaker than others and the game can truly only be appreciated best if played in succession. It truly was one of the strongest efforts from Telltale and gives amazing hope to their Jurassic Park game, not to mention The Walking Dead and Fables. The most recent Telltale game to “ship” were chapters 2 & 3 of the Straandlooper developed HECTOR-Badge of Carnage. These both continued the excellence of the first two chapters and truly compel you complete the entirely funny, well thought out and constructed point & click game. The way this project finished gives me not only hope to see what if anything Straandlooper produces next, but what the pilot program may offer. While it’s obvious Telltale’s efforts for the next year will be in the three previously mentioned franchises and hopefully a second Back to the Future game, I hope they understand what they can really do here for gaming as a whole. Especially being one of the only, if not the only developer who is not an independent creator to produce games like this with distribution on almost every available platform one can think of. There was a TellTale panel scheduled for New York Comic Con 2011, but based on research I could conduct it has been postponed for rescheduling or possibly all out cancelled. This is a shame as I was excited at the prospect of possibly meeting Stemmle, Grossman, et. al… but alas. I shall just continue to enjoy their products.